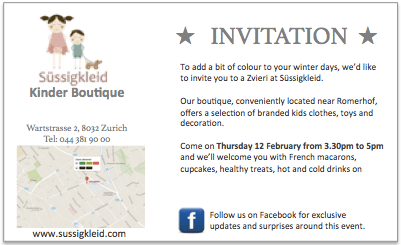 What's on in Zurich TODAY: complimentary afternoon tea! 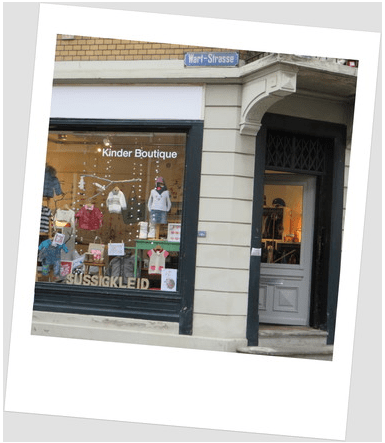 Gwen is a lady who opened Süssigkleid, a beautiful kids clothes boutique. She made the leap and quit her 9 to 5 job to set up a store and sell inspirational brands for kids. You will find your all time classic chic like Jacadi, Bonton, Burberry, Jean Paul Gaultier, your preppy brands like Ralph Lauren, Tommy Hilfiger and Abercrombie and Fitch but also your all time favorite like Petit Bateau. Most of her clothing is vintage, worn maybe once or twice max so in excellent condition which allows you to save a lot compared to retail price in Switzerland. She is also featuring some local and unique designers and that would be brand new items. What I also admire with her is her German skill. She is more fluent than any other French mum I met here as she can set up her business, do all the admin and translate everything in German. No wonder she found this clever name for her shop. “Süssiskeit” means “sweetness” in German and “Kleid” is the dress! So all that sweetness leads me to Liliane, my second friend part of this event. She is my favourite Chef and runs the Simply Macaron business. She is putting together an amazing high tea cake selection for us today. As we speak I’m sure she’s still baking and adding the final touches to her sweet treats (she’s not answering my Facebook pms!) You can also read my post about why I find her cakes are the best in town. Liliane will be here today to dress up the shop and if you ask her she will reveal some of her baking secrets! The store is 8 months old and it’s our way to say thank you to our loyal customers and get new ones to discover Süssigkleid. My role in this? I met Gwen, really liked her concept and the location of her store in pretty Kreis 7, she needed help with marketing and promotions, so here I am. Then as some of you may know, I love connecting people so I though about Liliane and Simply Macaron who’s eye for decorating and savoir faire with delicious sweet treats match the Süssigkleid brand perfectly, don’t you think? People have voted and among the 11 flavours that Liliane is offering, guess which three got picked the most?